The Kennedy Space Center sightseeing tour from Orlando includes a professional driver guide and round trip transportation from hotels along International Drive, Kissimmee and Disney areas. Visit the Kennedy Space Center visitor complex to learn everything about space travel! Once there guests will receive a short video presentation followed by a welcome meet and greet by an ASTRONAUT! The Astronaut will welcome our guests to the Kennedy Space Center and give them some hints and tips of ways to ensure they enjoy their day. There is no charge for this astronaut meet and greet. If for any reason the meet and greet cannot be provided on a specific date there would be no refund for not receiving the meet and greet. Founded in 1990, it is 37,500 square feet and is currently overseen by the Mercury Seven and U.S. Space Came foundations. The Hall of Fame is also home to the largest collection of astronaut personal memorabilia, along with space suits and other artifacts from earlier space missions. Counting down to liftoff of NASA’s early space programs inspired a nation to reach for the stars. Discover what it means to be a hero through the stories of NASA’s space pioneers at Heroes & Legends featuring the U.S Astronaut Hall of Fame® presented by Boeing®. Journey to space through stunning imagery and interviews with NASA astronauts Chris Ferguson, commander of the final shuttle mission, and Serena Aunon, newly chosen for future flights. Narrated by film and television legend Sir Patrick Stewart, Journey To Space gives an overview of NASA's past space accomplishments, current activities and future plans. 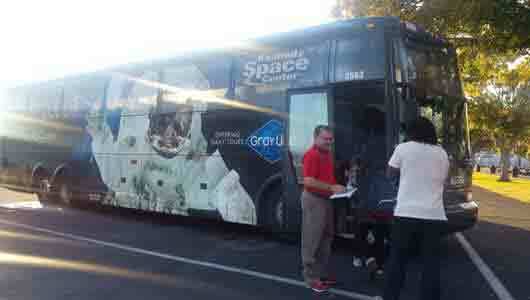 The NASA Bus tour guides you all over NASA's facilities and featured spots. The NASA Bus Tour is the best way to view all of the major highlights of the Kennedy Space Center. The informative tour guide leads you to the major sites. Stops include the Kennedy Space Center, Rocket Garden, U.S. Astronaut Hall of Fame, Space Shuttle Atlantis display, Shuttle Launch headquarters and more. These stops will provide an in-depth overview of the U.S. space program from past to present. You'll also be able to view priceless rockets, shuttles, modules, space suits and transport vehicles used on various space missions over the past 50 years. Other highlights of the tour include excellent photo opportunities of the space center and launch pads. Start your morning with a warm welcome from your driver on a specialty coach bus. The driver will have a packet for you, which includes your tickets to Kennedy Space Center. I’ve always loved space travel and was very excited to get to visit Kennedy Space Center. In the morning we boarded a coach bus with a fully functional restroom. There weren’t very many people on the bus so we were able to choose whichever seats we wanted. With a map and tickets in hand we had a seat and got ready for the ride. As coach buses can be cooler at times you should think about bringing a sweater or small blanket to keep warm if you chill easily. You can leave it on the bus during the day. You also may want to bring a snack for the trip. The journey to Kennedy was just over an hour long and we got the chance to watch a movie on the way to the space center. We watched Dolphin Tale, which was a treat for me since I’d never seen the movie. Once we were at Kennedy the driver got off the bus and enter the park with us. We were treated to our own special welcome and got to meet and hear from an astronaut. She freely answered any questions we had about her time in space. After the meet and greet we proceeded, with the driver (who basically became our guide), to the Atlantis Shuttle exhibit. Our driver happily took photos for us with our phone and camera outside the building where there is a life-size shuttle. He did the same for other passengers before entering the building. As we entered the queue, which has a countdown clock to your lift-off, he bid us farewell and explained that we would see him at 5pm to return to Orlando. The rest of the day at the center is self-guided, which I prefer because I can decide which exhibits I’d like to see and when. Once it was time to depart we went back to the bus and were happily greeted by our driver. On the return trip we got the chance to watch most of Star Trek (a newer film), which I had also not seen before. My tip to others taking this trip is to ask your driver for any tips he or she has that could avoid wait times and exhibits that you shouldn’t miss. Thankfully we were at the center on a slower day, when school was not in session. Overall it was a great day at Kennedy and the bus trip was much better than I’ve experienced in other cities and countries. The movies were an extra treat. We were picked up at the Swan Hotel by Mike our driver. He is such an amazing person! Gave us great tips on how to see as much as possible while at the space center. When we got there he walked us through the security and into a building and had a special surprise for us. We went into a room and got a good morning and welcome from Jake Lousma(a real astronaut!) and then we were free to go about our day. At the end of an amazing day Mike was there to take us back. Thanks gray line for a wonderful Day. Our guide Julie was amazing!! She is a star in the bus. Our trip to Kennedy space center was perfect organized! I can recommend this trip. What time do we arrive and return to Orlando? 17:30PM or 5pm dependent on closure time of facility. OR depart AHOF at approx. 5:15pm - 5:45PM dependent of closure time of facility; guests choice. Food, drinks (readily available at the KSC Complex) & gratuities.